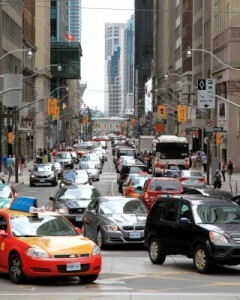 If you live in a large to moderately-sized city, traffic is probably a part of daily life. But how often do you think about the pollution exposure caused by all that traffic? UCLA researchers thought of that pollution regularly while conducting a recent study that compared risks of cancer in children to their mother’s level of pollution exposure during pregnancy. Previous studies have already proven that smog and pollution from cars, trucks and buses contain known carcinogens. It’s bad health news for adults, but UCLA Fielding School of Public health epidemiology chair, Dr. Beate Ritz and her colleagues say it’s even worse for developing fetuses. “The developing fetus is much more sensitive to these kind of pollutants,” Dr. Ritz told ABC News. To prove their theory, Ritz and her colleagues used two methods of recording traffic and other forms of air pollution throughout Los Angeles and Orange counties. They then compared that information to patients in the childhood cancer registries. Children who lived in areas with the highest levels of pollution had 5 to 10 percent more cases of acute lymhoblastic leukemia, 17 to 40 more cases of retinoblastomas, and about 20 percent more teratomas and tumors than those that lived in areas with less pollution. “Therefore [they] have a much higher risk for these early childhood cancers when there’s exposure during pregnancy,” Ritz said. The ideal, obviously, would be to move to an area with less pollution. But not everyone can do that, either because of work or available income. And even though pollution could be cut by putting more clean-vehicles on the street, it’s not something we have total control over. So what’s an expecting mom to do? Ritz says there are things that pregnant women can do to protect their unborn babies from the adverse effects of pollution exposure. “Definitely a diet high in fruits and vegetables is something that may actually help you get rid of toxins from your body,” she said. Previous studies have indicated that cruciferous vegetables like broccoli and cauliflower are most effective. Ritz also says that the highest level of exposure happens while sitting in our cars in traffic. That statement may mean that it’s possible that expectant mothers could cut their exposure by avoiding high traffic times. Do you live in an area with lots of pollution? Are you concerned about the effects of that pollution on your health or the health of your baby? Do you have any plans for decreasing the adverse effects of pollution on your baby?